If you ask a taxi driver to take you to Hanrapetutyan Street in Yerevan, be prepared to also say Alaverdyan. And do not expect to find Parpetsi unless you also know that not so long ago it was Ghoukassyan. When we asked a taxi driver standing under the falling snow whether he oriented himself quickly when customers give new names of streets, he probably thought that our question was the main reason why he stood in the cold for so long and shouted: "I am sick and tired of you. Today you give one name, tomorrow another. Give the street one name and that's all. They have changed the names of all communists. But are they no worse than today's thief-scoundrels." For more than a decade, street names once familiar have been changing in Yerevan; some in an effort to honor heroes and some in an effort to forget others. If a stranger tries to understand Armenia's history based on names of the streets, it will be clear for him or her that just after the creation of the alphabet in the fifth century, Armenia entered into the period of the Karabakh war. After 1988 when the Karabakh Movement began the streets were being renamed with lightning speed. And not only streets, but also schools and other institutions. A school named in honor of Lenin's wife, Krupskaya, was renamed after Nikol Aghbalyan, Minister of Education of the first Armenian republic. Armenia's first president after independence, Levon Ter-Petrossyan was a philologist with an appreciation for culture and Armenian history. His administration wasted no time taking down Soviet-issue names and replacing them with Armenian ones. So, the streets started carrying names of Armenian historians and kings: Tigran the Great, King Vramshapuh, Khorenatsi, Koghbatsi, Koryun and others appeared. And when the first casualties of the Karabakh war became known, streets and schools got renamed, especially in outlying regions. Then there was October 27,1999 and the killings in Parliament led to the most widespread renaming since independence. Yerevan subway, Sports and Concert Complex, school number 139 and the Main Avenue - from Saryan to Koghbatsi Street carry the name of Karen Demirchyan. The Republican Stadium, House of Officers, one street and a military institute were named after Vazgen Sargsyan. Though it is relatively peaceful in Karabakh, the process of renaming after the killed warriors and district heads who took part in the war is still going on. Mercifully for taxi drivers and tourists, the renaming slowed last year. Only six streets changed names in 2002. Still, it is enough to confuse a public still getting used to calling Alaverdyan, Hanrapetutyan, etc. People get used to one name, for example Amiryan Street, and no matter how many times you tell them that it is King Vramshapuh Street, all the same they keep saying Amiryan Street. 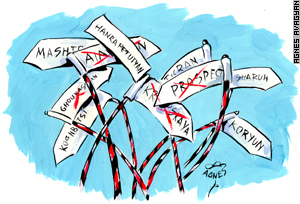 There's a committee for such things, the Yerevan Naming Committee. Irina Grigoryan, head of the committee, says her group is now working out a new system according to which the deadline for honoring someone with a street or public building will be extended. The order of naming any street is determined by the committee, which receives applications and decides on a candidate's worthiness to be publicly memorialized. Pending its decision, today's familiarity might be tomorrow's confusion for travelers looking for a single street with several names.